Not many authors get to say they’ve got an actual soundtrack for their novels. But I am one of those authors! 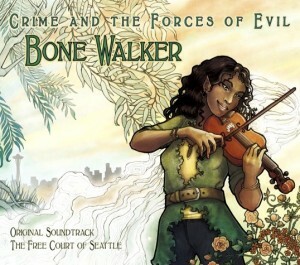 And as such, I’m proud to tell you all about Bone Walker, the original soundtrack album for the Free Court of Seattle series, by Crime and the Forces of Evil! If you’re a Great Big Sea fan, I’d like to particularly call attention to our takes of “Lukey” and “John Barbour”–because as you might guess, raving Great Big Sea fangirl that I am, their music is pretty much THE reason why Christopher MacSimidh is a bouzouki player from Newfoundland! Likewise, I’m really proud of Dara’s original composition “Kitsune at War”, which is a melding of several different tunes into one near-orchestral piece to provide the music for the fight scene in Chapter Seven of Bone Walker. Listen for the mutated version of “Road to Lisdoonvarna” in this piece. Or as Dara likes to call it, “Forced March to Lisdoonvarna”. Also? Trust me when I tell you that Klopfenpop’s remix of “The Burke-Gilman Troll” blows the roof off the tail end of the soundtrack, and in my not-at-all-biased opinion, it’s worth the price of admission all by itself. So go check this album out, won’t you? The album is available NOW, and here are all the places you can get it!